With the addition of an integrated electronic viewfinder, RAW file support, touchscreen operation, and a back-side illuminated CMOS, Nikon have attempted to make the new Coolpix A1000 more appealing to more serious photographers. Unfortunately, the EVF is hard to use, the RAW files slow the camera down too much, and the image quality from the tiny 1/2.3-inch sensor is no better than a smartphones. Add in a substantial price hike, and the Coolpix A1000 ends up being somehow less appealing than its predecessor, despite offering more on paper. Its main attraction remains the 35x zoom lens. 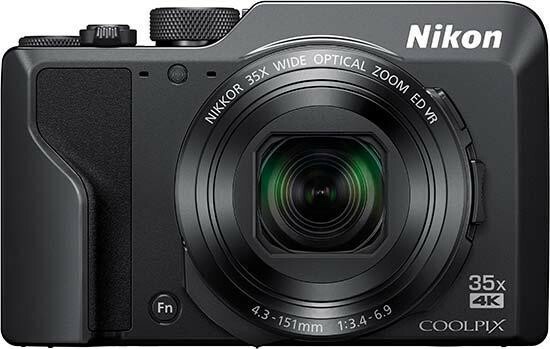 The Nikon Coolpix A1000 is a great compact camera if you’re looking for something to take on your travels, offering a lot in a reasonably small package, and if your main concern is a high zoom ratio, then it's a good choice. And once again, it produces high quality images under the right lighting conditions, and not only that, gives you full manual control if you desire it - making it a good choice for enthusiast photographers. But the addition of two features that we asked for when reviewing the Coolpix A900 back in 2016 - RAW support and low-light performance - turn out to be something of a double-edged sword. Sure, you can now shoot RAW files on a camera that you can fit in your pocket, but the A1000 takes so long to process them, even in single-shot mode, that you'll probably find yourself just shooting JPEGs all the time. The new, more sensible, 16 megapixel back-side illuminated CMOS sensor does very little to improve the image quality, with smearing of fine detail and noise evident in JPEGs and RAW files respectively from ISO 800 upwards, performance that's only comparable to a decent modern smartphone. Equally, the new electronic viewfinder looks like a great addition on paper, but actually looking through it fro any length of time turns out to be a literally painful experience. It's simply too small and too low-resolution to use for longer periods of time. Again this is a feature that more serious photographers should love, but considering its inclusion increases both the size and cost of the A1000, we kind of wish that Nikon hadn't bothered. With a launch price tag that's £50 higher than the A900, the A1000 costs 13% more in order to accommodate the new features and weather the Brexit storm. If all of those new features worked well, we would have said that the price rise was a fair one, but given that they don't, the new Nikon A1000 is even more of a hefty investment than its predecessor was, at a time when compact cameras have all but been obliterated by smartphones.